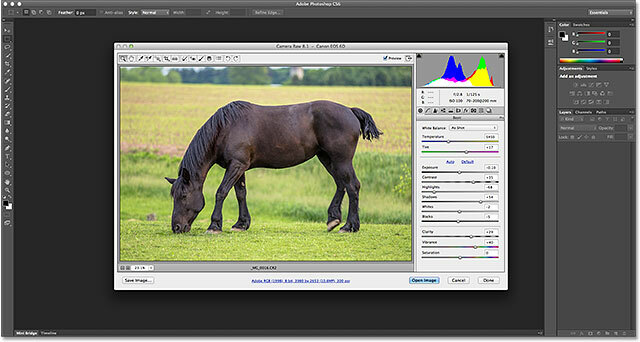 As we've learned so far in previous tutorials, Adobe Camera Raw is a free plug-in for Photoshop designed to make processing and developing images as simple and intuitive as possible. But did you know that Camera Raw also runs in Adobe Bridge? In fact, depending on how you've been opening your photos in Camera Raw, you may have been running it in Bridge without even knowing it! It may seem like a trivial thing. I mean, who cares if Camera Raw is open in Bridge or Photoshop as long as it's open, right? If it looks the same in Photoshop and Bridge (it does), and it does all the same things in either program (it does), then what's the difference? Well, Adobe gave Camera Raw the ability to run inside Bridge for a reason, and it's because there are certain advantages to it. In this tutorial, we'll learn what those advantages are, and how to open Camera Raw so that it's running in Bridge rather than Photoshop, including a look at an important option in the Bridge Preferences. Before we look at how to choose between working with Camera Raw in Bridge or Photoshop, let's first discuss the advantages that running it in Bridge offers, and there's really two main advantages to talk about. One can improve the speed of your computer, while the other can speed up your workflow. Photoshop, like all programs, uses up some of your computer's resources while it's open. Even if you're not working in Photoshop at the time, as long as it's open in the background, it's still using up resources. If you're working on a slower computer to begin with, having programs open in the background that you're not using can slow you down even more. 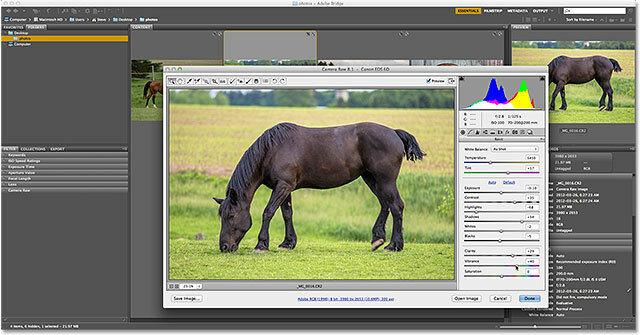 Camera Raw offers such a complete image editing environment that it's entirely possible to do everything you need to do with your photo in Camera Raw without ever needing to open it in Photoshop for further editing. That's why Adobe gave us the ability not only to select our images in Bridge but also to open and process them in Camera Raw without leaving Bridge, and without needing to open Photoshop. In other words, Camera Raw is perfectly capable of running in Bridge itself, or another way to put it, Camera Raw can be "hosted" by Bridge, just like it can be hosted by Photoshop. It doesn't need Photoshop running in the background, and that means Photoshop won't be hogging any of your computer's resources for no reason. 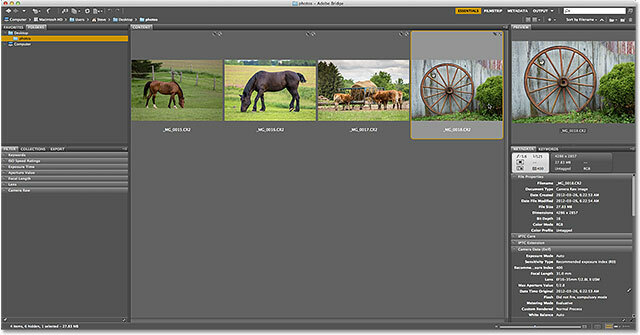 Another benefit to running Camera Raw from Bridge, and one that has an impact on your workflow, is that when you're finished processing one image in Camera Raw and click the Done button to close out of it, you're instantly returned to Bridge, ready to select and open the next image. 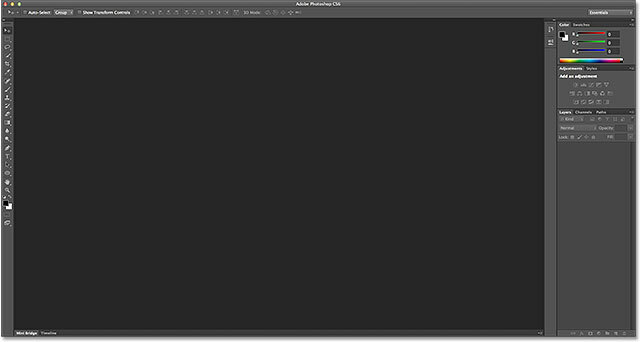 If you're running Camera Raw in Photoshop, however, and click Done to close out of it, you're stuck in Photoshop, with no image on your screen and nothing to do. At that point, you'd need to manually switch back to Bridge before you can select another image, and that just slows you down. So, not only does our computer benefit from keeping Photoshop closed when it's not needed, but our workflow also becomes a bit faster and more efficient. 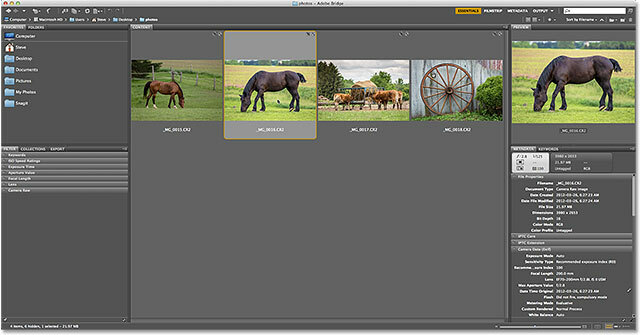 Clicking on an image to select it in Adobe Bridge. Adobe Bridge is still open and visible behind the Camera Raw dialog box. Clicking the Done button to close out of Camera Raw. Closing the Camera Raw dialog box instantly returned me to Bridge. Double-clicking on the image to both select and open it. Camera Raw is now running inside of Photoshop instead of Bridge. Clicking again on the Done button to close out of Camera Raw. Closing Camera Raw left me in Photoshop with nothing to do. Going to File > Browse in Bridge to return to Bridge from Photoshop. Now that we've seen the advantage of hosting Camera Raw in Bridge, wouldn't it be great if we could have Camera Raw hosted in Bridge simply by double-clicking on an image? As luck (and Adobe) would have it, there is! We've seen that by default, double-clicking on an image in Bridge launches Camera Raw hosted by Photoshop, but there's an option in the Bridge Preferences to change that behavior. Go to Edit > Preferences (Win) or Adobe Bridge > Preferences (Mac). Selecting the "Double-Click Edits Camera Raw Settings in Bridge" option. Click OK to close out of the Preferences dialog box, and now, every time you double-click on an image in Bridge to open it in Camera Raw, you'll be hosting Camera Raw in Bridge. And there we have it! That's a quick tip on the advantages of running Camera Raw in Adobe Bridge vs Photoshop! Check out our Photo Retouching section for more Photoshop image editing tutorials!